Like dance movement with fast music that excited? 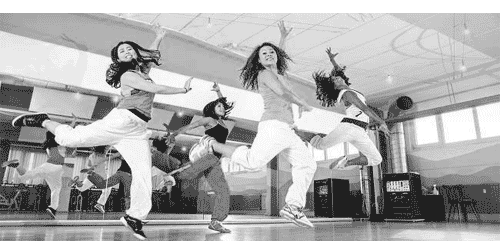 There is Zumba that can make the body fit and happy heart because it is done together with upbeat musical accompaniment. "Zumba" comes from the words of Colombia which means fun and fast-moving. Gymnastics Zumba is a fun series of cardiovascular movements and easy to follow, accompanied by music. This dance based aerobic movements accompanied by a combination of Latin and international music with a fast beat and being. Zumba was created accidentally by Alberto Perez, aerobics instructor who forgot to bring the music he used. Then he turned the dance music he used to dance. While doing aerobics with music, it appeared that the participants liked it very much. Holding entrepreneur, in 2002 Perez began selling DVD gymnastics with Latin music which they named Zumba. Gymnastics became global when Perez finally began writing guidelines and provide training Zumba. Zumba has now practiced in more than 40 countries. In addition to adults, there is also a Zumbatomic program for children ages 5-12 years. In addition to Latin music such as salsa and samba, Zumba music is now becoming more diverse with a blend of other music, such as hip-hop. Burn excess calories . Zumba doing gymnastics for 60 minutes can burn about 450 calories. A blend of various movements, from hip-hop, cha-cha, salsa, belly dance can shape up to be a more ideal body. Makes the mind sharper. The series of Zumba movements make people need to remember is stage by stage movement to be able to put it into practice. Increase muscle mass and bone density. Zumba movements concentrated in shaping the body parts that are important to the resilience of the spine, such as the muscles of the back, buttocks, abdomen, and upper legs. Lowers blood pressure and body fat. Doing fun sport like Zumba also makes you love doing it regularly so that more benefits. Make confident, happy heart, and feel energized. Zumba always done together, makes you more active in socializing and meeting new friends. In addition to the Zumba movements deliberately designed to not be complicated so easily practiced by all ages, fitness levels and abilities. This exercise can also be modified to be lighter so it can be a low-impact sport that can be practiced by the elderly and beginners. Before you start doing Zumba, consult your doctor, especially if you have a particular disease. This exercise is not recommended for pregnant women because it involves a lot of jumping movement and changing fast movement. It's good to follow a Zumba class with an instructor who has been certified or experienced. As a start, follow the movement Zumba classes offered for beginners. There are types of Aqua Zumba with a slower rhythm and Zumba Gold for the elderly. Ensure participate warming up before and cool down after Zumba. Wear clothes and shoes that are comfortable to move because Zumba involves a lot of rotary motion. Avoid dehydration by consuming water during the breaks. Avoid wearing jewelry in order to prevent the risk of falls, snagging, or scratched. Zumba gymnastics can be an option for those who are reluctant to exercise individual or body work too seriously. Happy heart, the body was healthy.